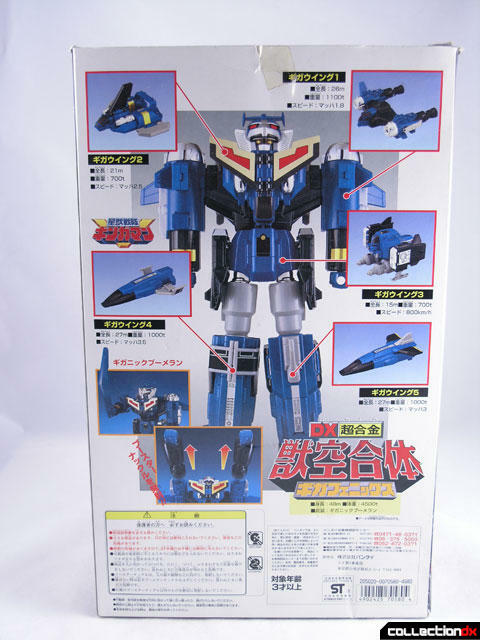 Giga Phoenix Beast Air Combination comes from the sentai series Gingaman, from back in 1998. Geez, 10 years flies right by. 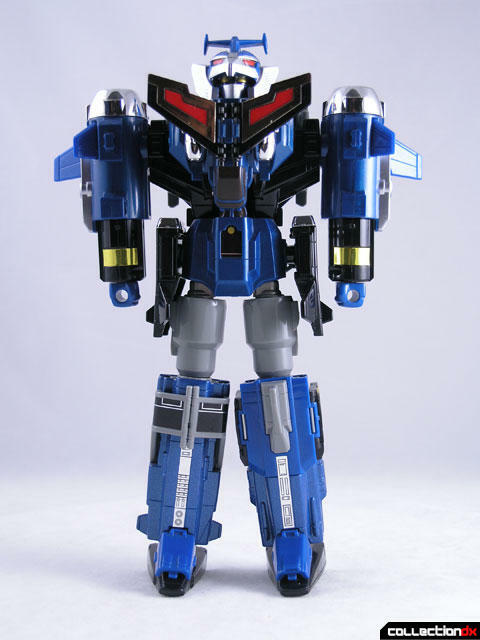 In the US, it was from Power Rangers Lost Galaxy, and here it was called the Stratoforce Megazord. The box is nice - has an old-school feel with a nice styrofoam tray. Giga Phoenix is comprised of 5 separate vehicles that combine into a giant robot. Each unit is very odd looking in my book - not at all aesthetically pleasing. Giga Wing 1 forms the upper chest of the Giga Phoenix. It features a main body with two cylindrical engines on either side. Most of the body is plastic, with the wings being flexible rubber. 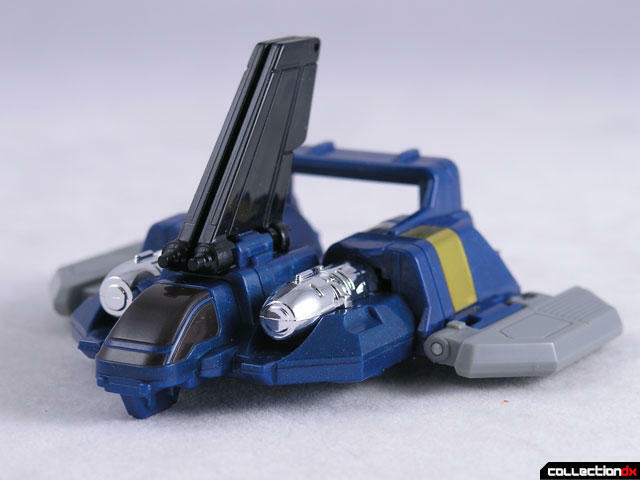 This vehicle looks like some kind of skiff or shuttle. This small unit is mostly plastic with two metal bars connecting the parts. It becomes the chest / backpack of Giga Phoenix. 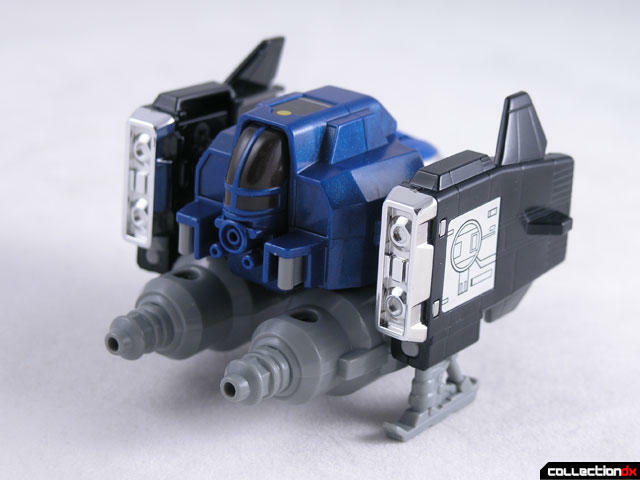 The third vehicle resembles a dropship, escape pod, or helicopter without a rotor. 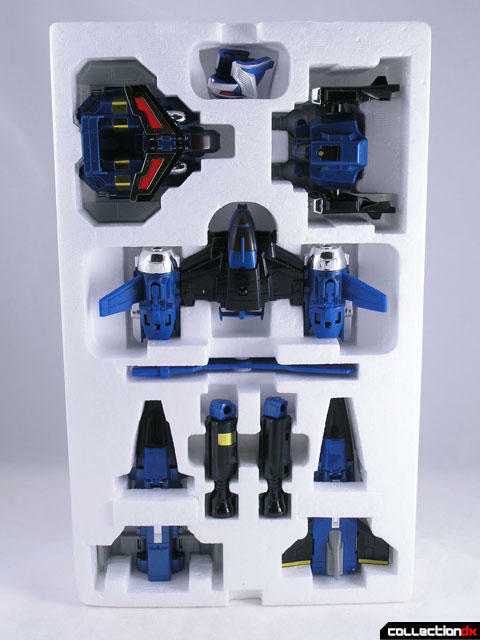 This unit is mostly plastic, with diecast connecting bars onto the gray plastic portions. This sleek ship becomes the right leg of Giga Phoenix. This unit is mostly metal, with the front of the leg and the foot being solid diecast. 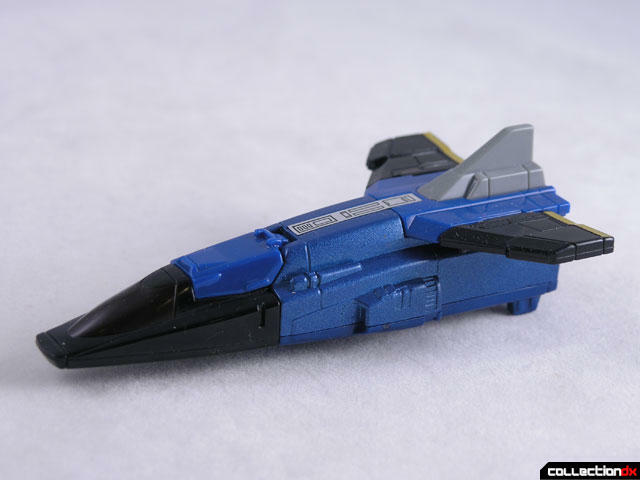 Although it looks similar to Giga Wing 4, its actually an entirely different toy, although with similar metal content. Combining the 5 vehicles together is pretty simple and self-explanatory. This is not brain surgery. One thing I don't like though is the addition of the rubbery helmet that goes over the face. The original face looks cool - something out of B-Fighter - but the mask is all misshapen and odd. It just doesn't work. Armaments include firing fists and a giant wing weapon that can be stored in either hand. Once combined, you are filled with an overwhelming feeling of... meh. It just doesn't do it for me. 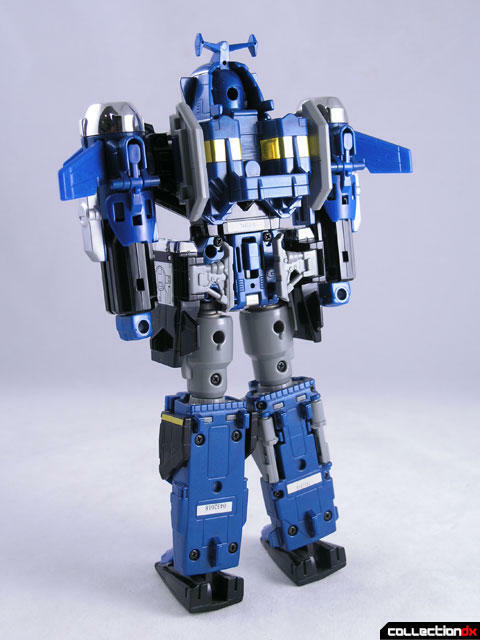 I mean, its a giant diecast combining robot with shooting fists, but the design is so opposite what I look for in a toy. It's lanky, and unbalanced, and most of all its unattractive. When it came over to the US, the metal in the lower legs was removed and the canopies of all the vehicles was changed from brown to silver. If you need metal, go with the JP version. Really-? You're gonna shoot this one down, huh, Josh? I thought it was fantastic! 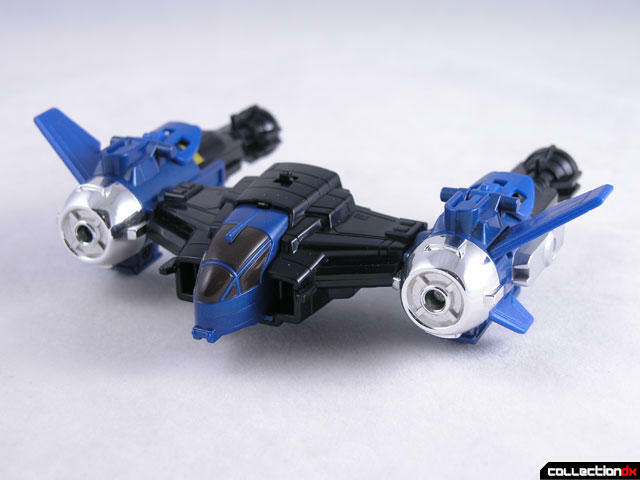 Oh, one thing- you said that there's die-cast in Giga Wings 4 and 5? Is that right? 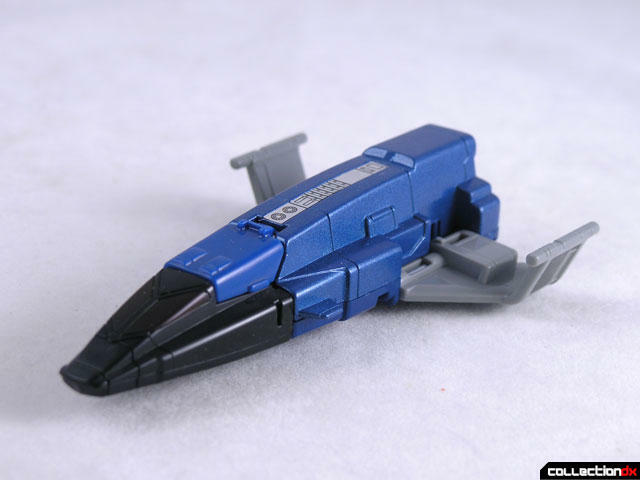 Nah, it looks a bit plain, especially coming from a Super Sentai Series. I guess they look better when they have rainbow color scheme, as usual. This could be a nice robot, but definitely not a Megazord. I'm normally not a fan of Super Sentai robot designs, but I really like the look of this. 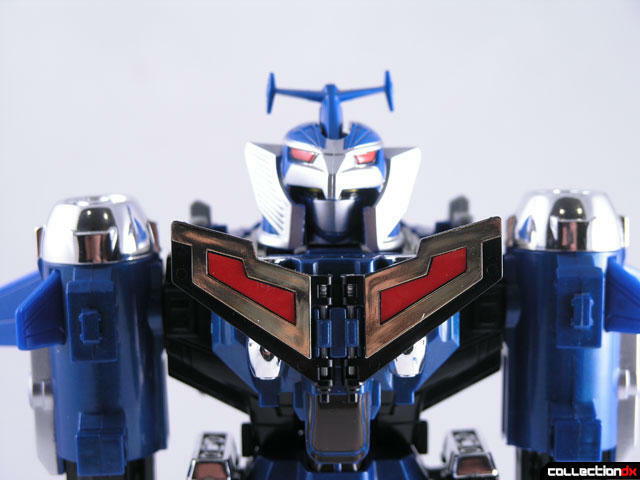 Maybe that's it's flaw: it's a good looking robot, but not a good looking sentai robot. CMIIW isn't Eva review this things before, or is it the US version? I believe that Ginga Phoenix and Giga Rhinos were lame additions to the Gingaman show itself...wait, the show itself was pretty boring to begin with. Agreed. I haven't seen the series myself, but the biggest disappointment for me was that none of the Gingabeasts could swap/merge with each other after forming their primary combos. Now, granted, some of the earlier series had no super-combos, but I still like them! The difference here is that none of the "Ginagaman" mecha look all that good. 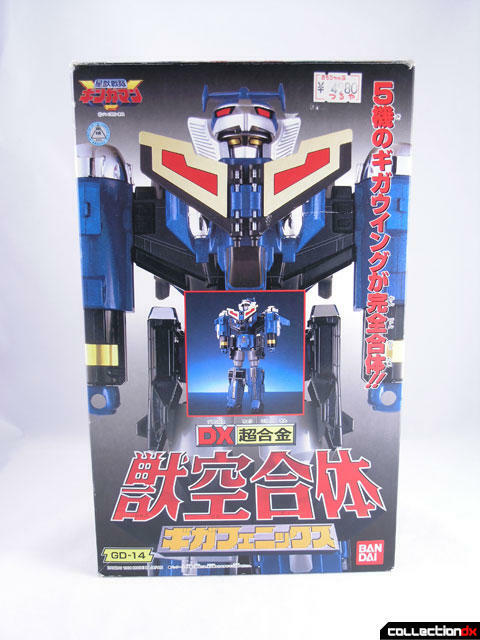 But, as I said in my review for the Deluxe Stratoforce Megazord, GingaPhoenix was the exception in many ways, and I really liked it without being turned off by its off-the-beaten-path approach. 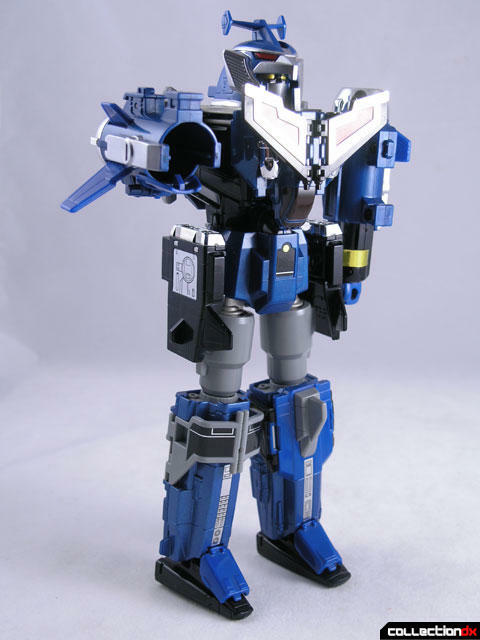 Very subdued for a 'Zord, which is a nice departure... but the only thing I like about this design is the Chestplate. Otherwise, I think it looks like Babe the Blue Ox mated with a telescope.